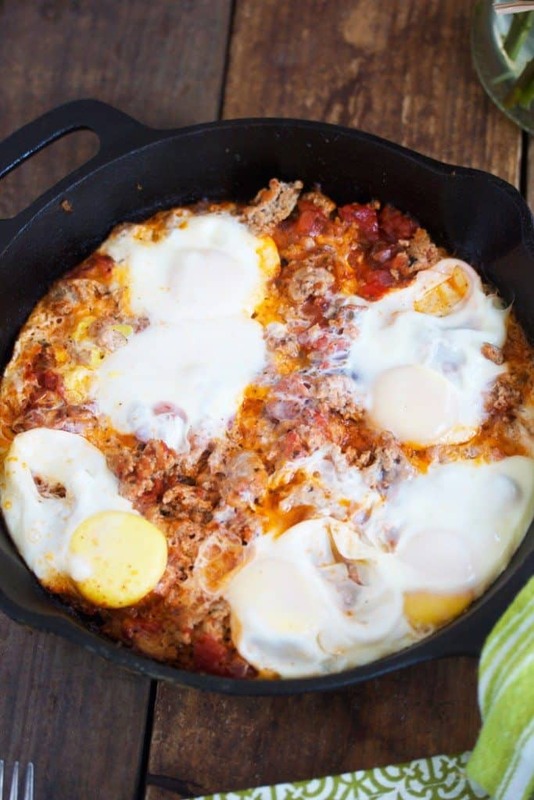 This 3 Ingredient Breakfast Skillet is hearty, flavorful and QUICK! 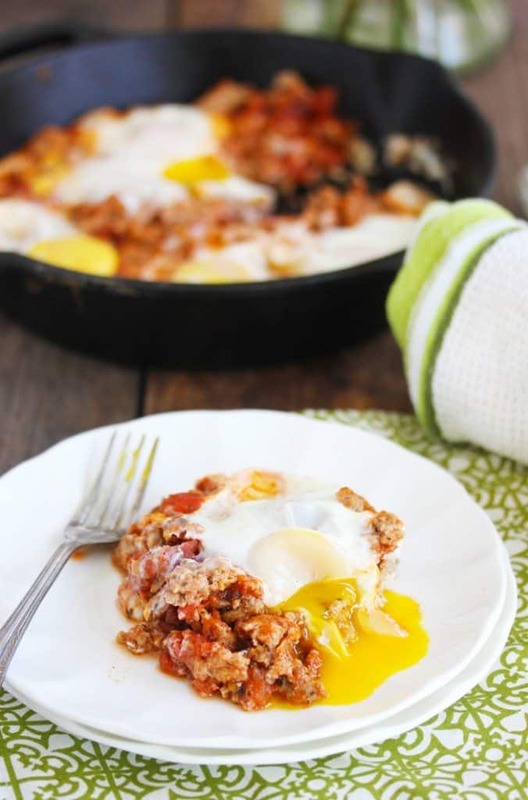 It’s the perfect, customizable, week day breakfast. Sometimes I throw some other veggies, like spinach, onion, and sweet potato, into the mix, but most of the time it’s as simple (and tasty) as this 3-Igredient Skillet. I love using a good salsa because it gives you all the flavors you need! Literally, you don’t even need to spice this beauty. It’s. ALL. Packed. In! Heat skillet with oil over medium heat, and place turkey into it. Cook until turkey browns and no pink remains. Add in salsa and mix to combine, let cook together for 2-3 minutes. *Adjust based on how many people you are serving. Example: If you're making it for 2 people, and you want 2 eggs each, reduce the amount as desired. Those drippy yolks! I am dying over their perfection. 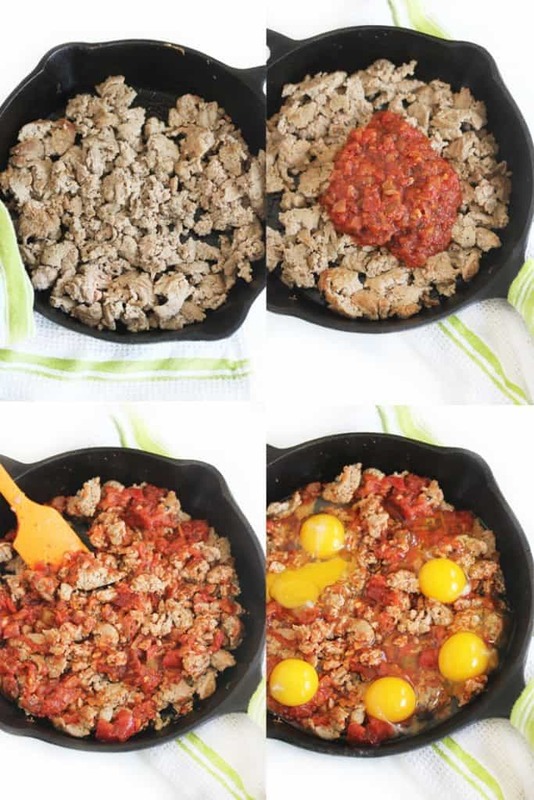 Also, how easy is this skillet? Love how much spice is packed right on in! Pinned! I have not had breakfast yet. Now I need to run to the kitchen and make these. Oh man look at those gorgeously runny eggs. this looks delicious, but i do not like eggs cooked with the yolk still “there”! I’m curious if i would be able to pour egg whites over this? UM YES! THIS is happening today!! I am going to convince my friend to just come over for lunch as opposed to us going out!!! Looks awesome! Also wondering if egg whites would work, I’m not a fan of runny eggs 🙂 And, what salsa do use or recommend? Yes, egg whites works! I use this salsa: http://www.amazon.com/gp/product/B00NLVKI48/ref=as_li_tl?ie=UTF8&camp=1789&creative=390957&creativeASIN=B00NLVKI48&linkCode=as2&tag=lexiscleankit-20&linkId=PIZAAM574QDT7EXK (affiliate link) and get it at BJ’s! 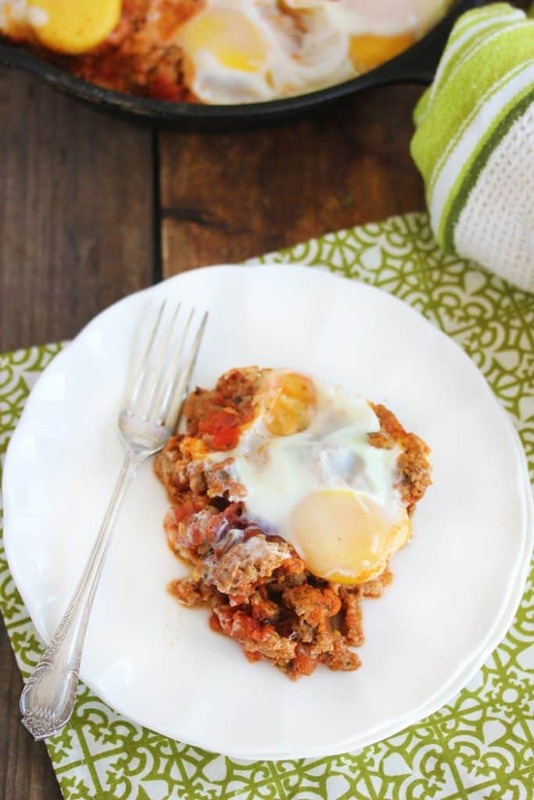 Totally trying this with some organic fresh ground sausage I just bought and mixing it up with crushed roasted tomatoes! THANKS!!! This would definitely have me jumping out of bed in the morning to eat! Wow looks so flavorful and delicious! I used some deer burger we had in freezer and it was fabulous! So easy & delicious! My hubby loved it! Do you keep the heat on while the eggs cook? This is Great..I Added Chopped up Kale, I have so much growing, and some crimini mushrooms..
SOOO good! I have added some gluten free potatoes to increase the awesomeness but can obvi be deleted at anytime. Everything about this is amazing. Having it for dinner right now! Thanks! I can’t cook anything but I tried his and it was delicious and super easy. I should have used slightly hotter salsa since the eggs cut it down a bit but it was great. 1) When cooking the turkey initially, do you empty the fat that comes out prior to adding the salsa? 2) Do you drain the liquid content of the salsa prior to adding and use only the solid portion? I can relate. I am 70 and have arthrItis in both knees. It was so painful that I could not walk. Just over a year ago I began eating organic fruits and vegetables, chicken, turkey, and fish, nuts, and good oils. No processed foods, no grain, no dairy, on and off with eggs, no nightshade, no legumes. I bought a spiralizer and and a juicer. I already had a food processor. I have stuck to the plan and a year later I can walk again and even without pain. I lost 50 pounds last year and I can’t remember when I felt this good. I kicked 2 prescriptions and I am hopefully soon going to kick the other 2, and be med-free. Inflammation is the problem so I went online to find everything I could about it. Then I looked for paleo recipes. I learned to avoid the things that would increase inflammation and choose those that would help to heal my body. I make bone broth with all the bones, and drink it daily as well as use it in recipes. I prayed for God to help me know what foods to eat and what foods to avoid. I probably enjoy my food now more than ever because it is fresh and delicious, and I know I am putting healthy food into my body. There are so many delicious recipes and ideas online that I don’t feel like I am missing out on anything. 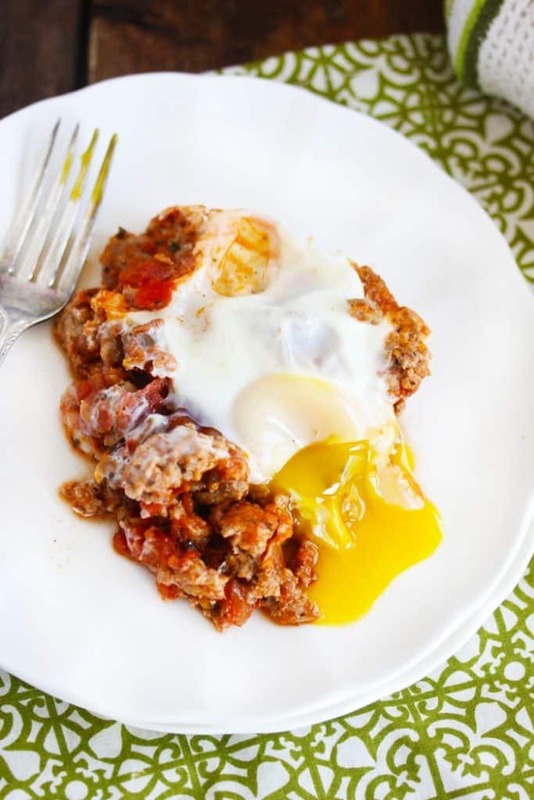 I have also taken some of my favorites and made paleo substitutions so that I can still enjoy my favorites. I hope you can find a plan that works for you. I had some ground turkey to use up to make dinner… didn’t have any salsa but did have a can of tomatoes with green chiles so I used that instead and also threw in some leftover, cooked sweet potato chunks. It was a hit! Next time, I’ll have to try it the original way! I don’t, but thank you for reaching out! Hi Lexi, I would like to subscribe to your website.. Please let me know if there is anything III can do to help. Thank you. 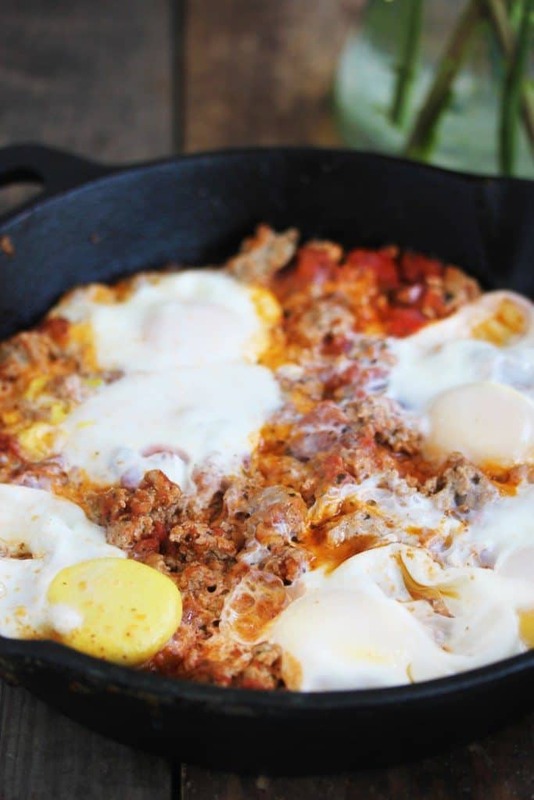 Instead of ground turkey, would ground sausage work with this recipe??? ?